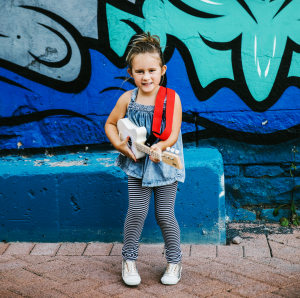 It is hard to know when the right time is for your child to start learning the guitar and knowing which Childrens Guitar to buy them can depend greatly on the individual child. For a child to be able to develop and progress with a six string instrument, the first hurdle is for the child to be able to grip and form chords of a half size classical guitar. Usually a child will have to be 7 years old to be able to do this consistently enough to form chords and play a song. Prior to age seven the most popular option for younger learners is a 4 string ukulele which has a much thinner neck, a short scale and soft nylon strings. This format of instrument addresses a lot of the issues that younger kids have in playing a stringed instrument although it is in different tuning to a traditional six string guitar. So you want your kids to play guitar, so let’s teach them Ukulele….? and feels like a real guitar that will allow the learner to play simple to more complicated songs. The next problem was to address was the tuning, but you can’t fit six strings on a neck that thin and how can you get that guitar sound without all the strings. The solution was simple really. On a standard six string guitar, chords comprise of two three note triads to comprise the chords, while on a piano you only need 3 notes to form a chord. So why can’t that be the same on a Childrens guitar? This is where the Loog guitar was born. A three string simplified version of a six string guitar, that is tuned exactly the same as the Treble (or high strings) of a regular guitar. This means that the chords on a Loog are a simplified version of the chords on a regular guitar. This means in a lot of cases chords are simplified to simple one finger chords. For example E major, C major and G major are all only one finger chords, while E minor is open strings. This means that children or beginners can play very simple chords and songs right from day one. So for a simplified entry into guitar super stardom, the Loog guitar is the perfect childrens guitar to make learning fun!